Word out of Hollywood these days is that actor-writer-director Sylvester Stallone has dropped plans to make Rambo V, choosing instead to focus on The Expendables 2. This is no surprise; Rambo IV, also called John Rambo and just Rambo, was a nicely handled comeback (and a perfect one-two punch with Rocky Balboa), but it was The Expendables that really put Stallone back on top of the Hollywood action heap. Watching The Expendables this weekend (finally), a few things occurred to me. First, this is really a Jason Statham movie, and I would like to see Jason Statham play someone other than the bald smartass buttkicker he always plays. Secondly, this movie needed Christopher Walken. 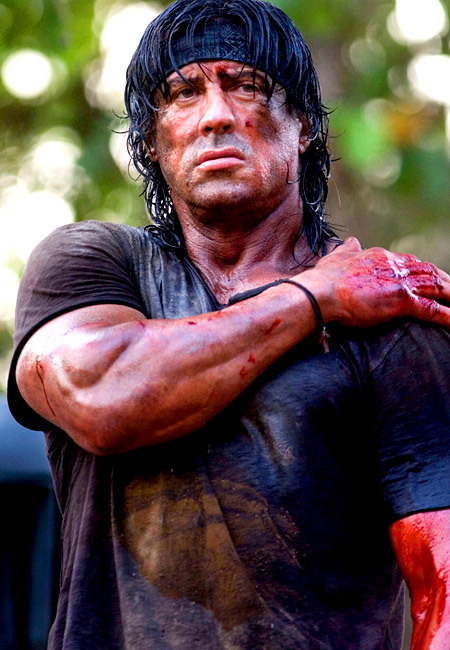 Third, Stallone’s character, Barney Ross, was really John Rambo. When we last saw John Rambo, he was back on U.S. soil, going to see his daddy. Mention is made in The Expendables that “Barney Ross” is not his real name. Barney is in the process of getting a series of tattoos from Mickey Rourke (which seems to me about as safe as getting a series of fuckings from Mickey Rourke, but hey, that’s Hollywood). A joke in the film has someone mistake Barney’s raven tattoo for a black chicken. The raven is the symbol of The Expendables. Rambo’s callsign in Vietnam, when he was an elite killing machine before being captured and tortured, was Raven. When Rambo wakes up after being frozen for decades in a cryogenic prison, there is mention of a fellow inmate named Scott Peterson who was put in for murder in 1999. This predates the actual real-life Scott Peterson murder case! It’s like that World Series bit in BTTF2. There is repeated mention of the need for psychotherapy in the film; at every turn, Barney gives a knowing nod. Wait, No.7 was from a different movie. I can’t tell them apart, to be honest. I still tend to think Brigitte Neilsen was in First Blood. Barney Ross has big muscles, can fly a plane, and looks kind of an older drag-queen version of Sylvester Stallone. So did Rambo in the last Rambo flick! The conclusion is inescable: After the events of Rambo IV, John Rambo got some professional help and probably Zoloft, calmed down, likely got laid and finally realized that he should quit hiding in the jungle, get a haircut and finally get paid to do what he does best. So he formed a mercenary force, recruited a bunch of former wrestlers, changed his name and got some tattoos to cover up his telltale torture scars, soon finding the cameraderie missing for so many years (remember the opening of First Blood?) and shaking off the brooding gloom that had darkened the past few decades. Also, he still gets to blow things up and shoot people. 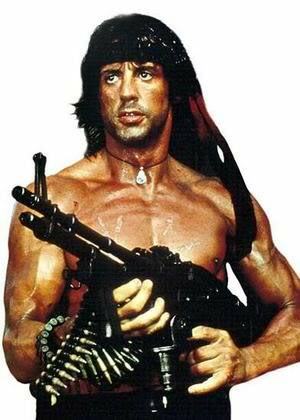 So when The Expendables 2 comes out, folks, you’ll be watching Rambo VI. Well, First Blood 6 if you want to get technical about it. On a positive note: at one point, Rambo V was going to feature Rambo hunting an alien monster in the jungle. I am not making that up; we dodged a 50-cal bullet that time! There has also been talk of sequels to Oscar and Stop Or My Mom Will Shoot, starring Christopher Walken, with Stallone as his mom. Rambo or Barney? You decide. “You know what you are. What you’re made of. War is in your blood. Don’t fight it. You didn’t kill for your country. You killed for yourself. God’s never gonna make that go away. When you’re pushed … killing’s as easy as breathing. — John Rambo, Thailand, 2008, to himself while making his own weapons in a blacksmithy. Seriously. Thank you, I thought that I was the only person to notice all those relationships between Barney and Rambo. Another fact: In The Expendables, Arnold Schwarzenegger (Trench) tells Bruce Willis in the church that his friend (Barney) likes to play in the jungle. True – Trench tells Church, Barney loves playing in the jungle. And John Rambo 1, 2 & 3 are not mostly urban – they’re mostly in jungle.